Today is a very special day I wanted to celebrate with you: eTeks, the small company I created for my freelance activity, is 20 years old! 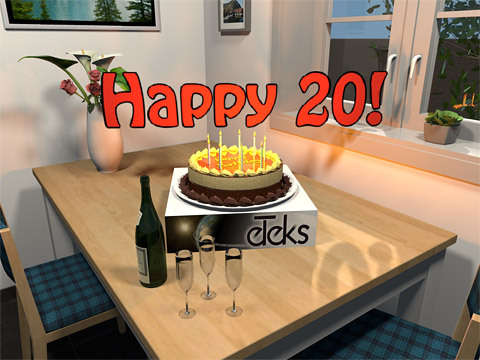 20 years during which I had the chance to use and improve my skills in programming, share them in books and during training courses, and create open source software like Sweet Home 3D. Thanks to all the great companies which trusted eTeks and to all Sweet Home 3D users for their support. What a great, innovative, future-oriented, visionary and above all open life's work! Emmanuel, you point the way to the future and therefore you will be successful with your attitude in the future! I congratulate you wholeheartedly on your accomplishment and wish you only the best for the future! I wish You a long and happy life! Many thanks for this software which surprising me everyday. Thanks You make me force to learn more than I think I can. In one? word: THANK FOR ALL YOU DO FOR US! Thanks for your very kind and appreciated messages! I join the others in congratulations and thanks. This is truly one of my favourite programs.